of these vegetables can successfully be stored for months if they’re given the right storage conditions. Even without a garden, buying quantities of these vegetables while they’re fresh and “in season” and storing them for later winter use can make sense. Both of these approaches provide fresh vegetables more economically than buying from the supermarket in the middle of winter when it’s most expensive. 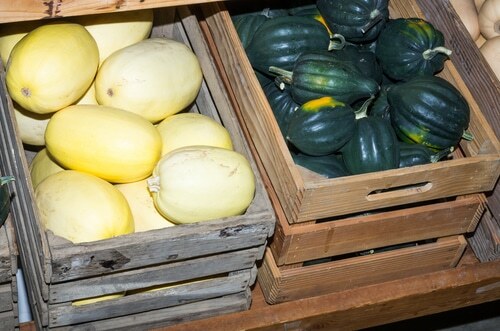 In addition, vegetables stored at their peak maturity usually have better flavor and higher nutritional value. 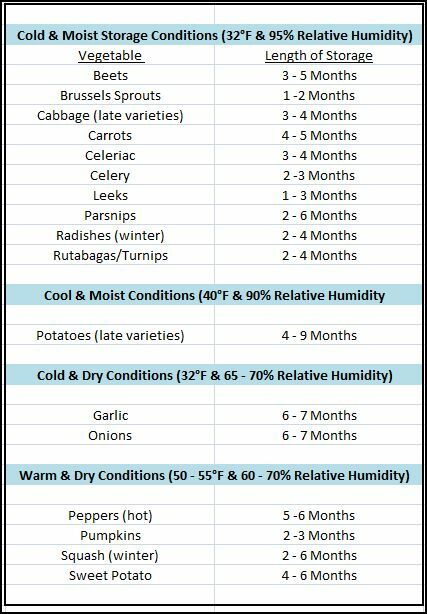 Vegetables that are good candidates for winter storage can be classified into four groups depending on the temperature and humidity conditions that are ideal for their storage. 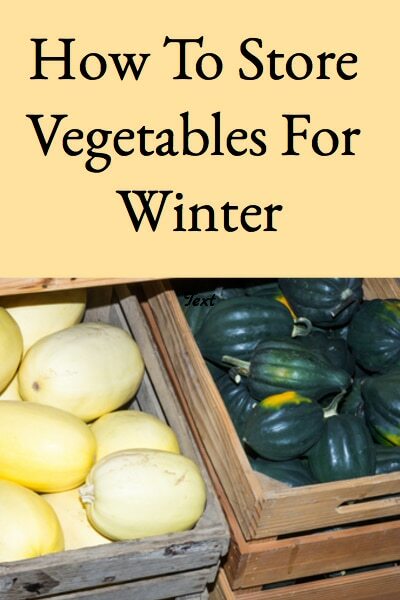 Vegetables are usually packed in some type of material for winter storage to provide insulation or moisture retention while reducing disease transmission. Sawdust, clean straw, dry leaves, hay, corn stalks or peat moss are often used as insulating materials for vegetables that need dry storage. Because they can become contaminated with mold and bacteria; these storage materials should be used for only one season and then they can be recycled into compost or mulch for the garden. Vegetables that need moist storage shouldn’t be directly exposed to air and moistened sand, sawdust, or peat moss are commonly used as storage materials. Plastic bags or liners can also be used to help retain moisture but should be perforated at regular intervals to maintain air circulation and prevent condensation. Alternating layers of produce with packing materials and wrapping items individually helps reduce disease transmission. Old newspapers have commonly been used for this purpose. In addition to using the right temperature, humidity, and guidelines above; vegetables should be stored in dark, aerated, pest free conditions. Standing water, freezing, and storage with fruits (which give off ethylene that hastens ripening) should all be avoided. Vegetables shouldn’t be stored until the temperature in the storage area has dropped to the appropriate level. Often, getting the vegetables into an adequately cold storage location at peak maturity is the biggest storage challenge; however, it’s essential to achieving long-term storage success. We’ve had great success with potatoes, winter squash (see Winter Squash: Harvesting, Curing, & Storing), and many of the root vegetables; even though our storage conditions still aren’t quite ideal for long-term storage. We’re using a basement root cellar that generally isn’t as cold or moist as it should be, yet we’re still able to store a great deal to last through the winter months (the link HERE provides plans for building a proper basement storage room). There’s something so satisfying about gathering the ingredients for winter meals from what you’ve grown and stored rather than running to the supermarket!